Washington policy debates are primarily about being admitted to the club of participants rather than about logic and evidence. Until the public understands this fact, there is little chance that the vast majority of people will have much ability to influence the course of policy. 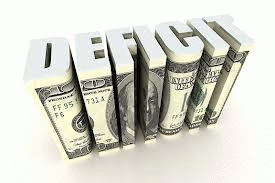 The budget deficit is the current obsession in Washington. You can get big bucks spinning scare stories of huge budget deficits that will bankrupt the government and sink the economy. However, the indisputable reality is that the large budget deficits of recent years are due to the economic downturn following the collapse of the housing bubble. But the people who make this point are not invited to take part in the discussion. Pointing out this fact makes one shrill; you have to say that the deficit is a huge problem to be a serious person in Washington. This sort of defiance of reality is not new for the serious people in Washington. Back in the late '90s when the stock market bubble was reaching its peak, you could find folks like James Glassman, the co-author of Dow 36,000, presenting their wisdom on a weekly basis in the Washington Post. In fact, at the peak of the stock bubble, serious people in both the Republican and Democratic parties insisted that the stock market could continue to provide historic rates of return, even though the price to trend earnings ratio was more than twice its historic level. In fact, they wanted to invest Social Security funds in the stock market. Some of us did try to warn that this defied basic arithmetic. We argued that lower future rates of return would mean problems not only for Social Security if its funds were placed in the market, but also for pensions and individuals who had invested their retirement money. This view was not allowed into the debate at the time; such warnings were dismissed as "shrill." Ironically, the argument that the stock market will not provide its historic rate of return going forward, even though the ratio of stock prices to trend earnings has returned to historic levels, is currently fashionable among the serious people. This argument receives great favor in the context of the need to cut workers' pension benefits, especially in the public sector. The arithmetically grounded counter-argument, that when the price to earnings ratio is near its historic level returns will be near their historic level, has been virtually excluded from the Washington policy debate. Of course it is not just economic policy where the outcome of the debate is determined by who is allowed to take part in the discussion. We went to war with Iraq to keep Saddam Hussein from using his weapons of mass destruction on neighboring countries. All the serious people agreed that the invasion was necessary. There were certainly people who disputed the evidence that Iraq had weapons of mass destruction or was close to developing them, but the Washington media largely excluded them from the debate or dismissed them as unserious types whose views should not be given credence. Perhaps the best demonstration of the corruption of the Washington policy debate is that former Federal Reserve Board Chairman is still a member in good standing among the serious people. Last week he told a conference organized by Wall Street investment banker Peter Peterson that a recession would a price worth paying to get the cuts to Social Security and Medicare that he wants to see. According to calculations by the financial reform group Better Markets, based on the Congressional Budget Office's projections, Greenspan's incredible mismanagement cost the economy more than $7 trillion in lost output, or more than $60,000 per household. But once you're admitted to the club of Washington's serious people, it takes more than a small mistake to get you thrown out. The point here, as Greenspan put it so eloquently last week, the rich and powerful want to cut your Social Security and Medicare. They will say lots of things that are untrue about the debt and deficit to scare you. There will be few opportunities for correcting this nonsense, because hey, they control the news outlets. So just remember, it's not even a bad movie. It's just the serious people trying to take money out of your pocket and put it in theirs.